Are you planning on holding a meeting with colleagues or for your employees? Well, you might want to hand out some meeting survey samples. This can really help you out on maintaining the quality of your work that are important to your company such as sales. If you have never had these kinds of situations before in the workplace, then it’s a good idea to start learning about them now. 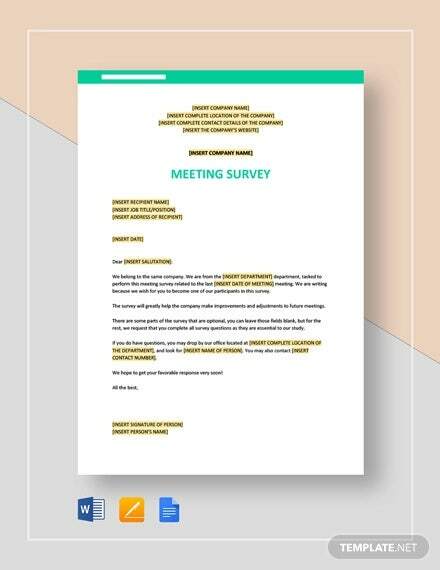 Luckily for you, we have collected samples of meeting survey templates for you to download and print as many as you want. 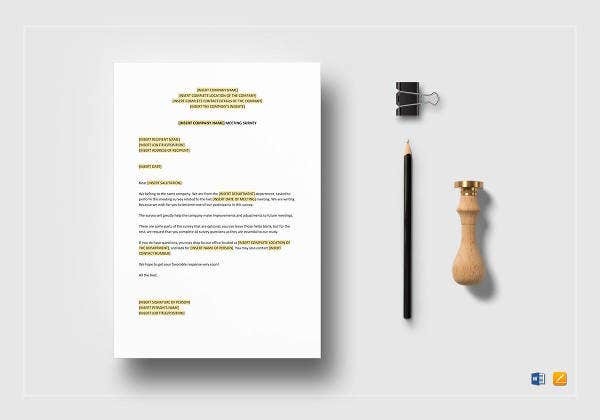 You can edit or customize these to add in any important details. If you haven’t found what you are looking for, check out more of our survey template samples on our website. 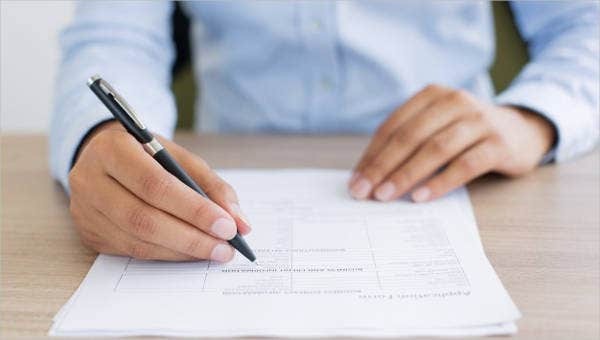 Before all else, what exactly are surveys? Surveys are a general view, examination, or description of someone or something. 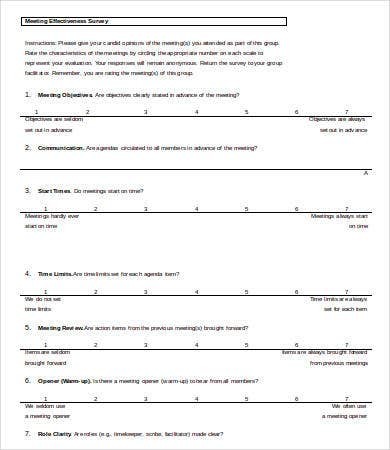 Meeting Evaluation Survey Template. 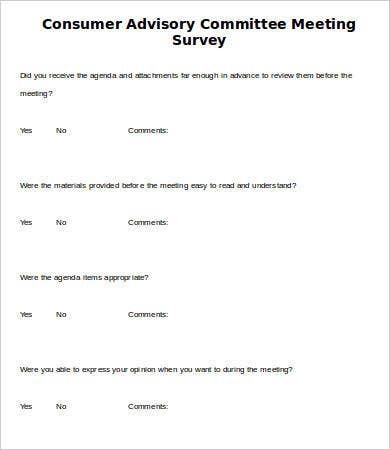 This kind of survey is used for evaluating meetings such as business meetings. This focuses on the organization and contents of the meeting. It consists of four sections: General Aspects, Logistics and Organization, Contents, and Suggestions. 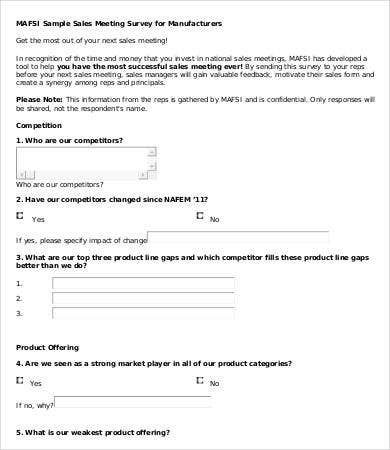 Sales Meeting Survey Template. This survey is used for evaluating sales which are usually held at the end of a certain date such as at the end of the quarter or month. This is to help brainstorm on ideas that can benefit the company. Team Meeting Satisfaction Survey Template. This is to evaluate team members or employees. This helps you know about any problems and complaints your team might have that can help improve your team’s performance. 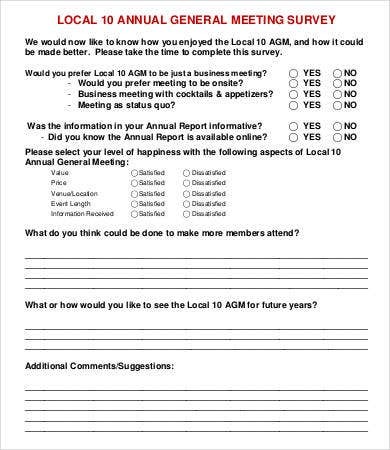 Annual General Meeting Survey Template. This survey is given during meetings that are held once a year, hence the word annual. This help evaluates general inquiries and complaints your staff may have. 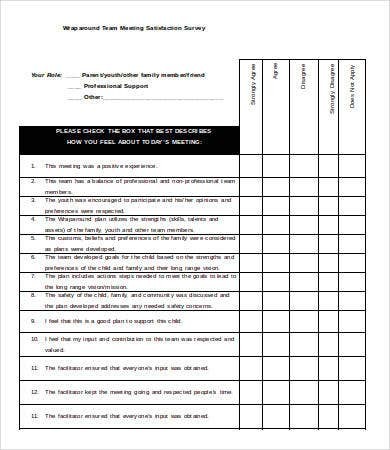 For more lists of survey templates, we also offer Blank Survey templates and Customer Survey templates on our website. Consumer Advisory Committee Meeting Survey. The purpose of the committee is to make recommendations to the commission regarding consumer issues within their jurisdiction. They facilitate the consumers proceedings before the commission. Meeting Quality Survey. This survey evaluates the meeting that was held in order to know how the proceedings went and if everything went smoothly without any problems. Council Meeting Survey. 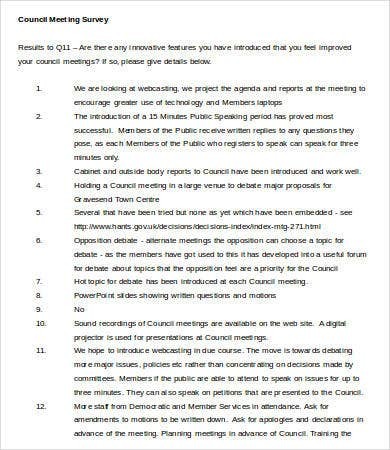 As the name suggests, this survey is used for council members in evaluating their meetings. 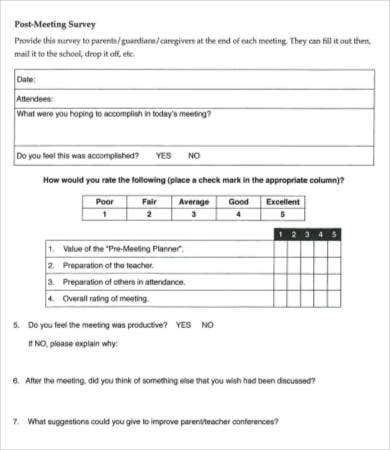 Post Meeting Survey Template. This survey is given after the meeting has adjourned. This is for the attendants to evaluate the meeting. Plenary Meeting Survey. Plenary meetings are conferences in which all members of all parties are mandated to attend. This type of meeting can discuss a broad range of content such as panel discussions and keynotes. 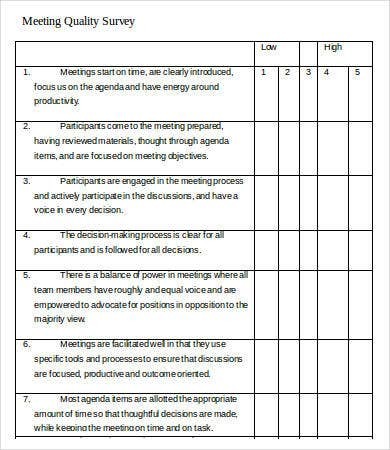 Meeting Effectiveness Survey Template. This survey allows you to engage with your employees with their unspoken or unnoticed issues. You can use the results to make well-informed decisions. We hope this article has helped you in deciding which kind of survey that matches your needs. It is important to keep track of how things are going within your company and hear your employees out as well. For more survey samples, check out our Satisfaction Survey templates that we offer on our website.